Went out to Bolsa Chica and the sounds of nesting terns filled the air. I tried to get pictures of terns in the air. I think this is a Royal Tern in flight. They flew out in pairs and groups and alone to catch fish. Near the bridge was a good place to catch them on the wing. Boy did they go fast! This one found a great fishing place on the rail of the footbridge and didn't move from it. A disapproving glance. I have a zoom camera that zooms to 12x optical and then has digital zoom on top of that, but this fella on the footbridge thought I had gotten close enough. These two staked out the post--obviously they have been there for a while. They defended it against any tern that ventured near. The colony of terns was constantly noisy and on the move. One scare and they all flew. It was quite a sight. Nothing is quite as lively as nesting time at Bolsa Chica. ".....My boyfriend noticed a male duck wandering in the parking lot who looked distressed. He also noticed a female duck (a mallard perhaps?) nesting in a nearby median. Both ducks are away from traffic, but in the parking lot [which has a lot of businesses]....I don't know what to do. Who can I call to help? Can you help?" This one is the closest to the duck you mentioned. Just to ease your mind. Ducks and Mallards in particular do this all the time. Usually there is a lake or pond nearby. Many parking lots have Mallards nesting around this time of year as do neighborhoods and they often make the dangerous journey back to the lake on foot with the ducklings. Scary for them and us, but part of the life of a Mallard. The area you mention is actually not that far from a park with a lake which is probably why the Mallards chose this spot. I received a question about a bird identification. 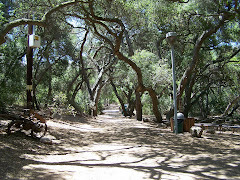 "Hello, I live in South Orange County (Laguna Niguel). I am now taking up the hobby of feeding birds.There are a couple of birds I'd like to know what they are." "1. One bird is a little bit larger than a House Finch, is a dull brown color, and likes to forage on the ground. 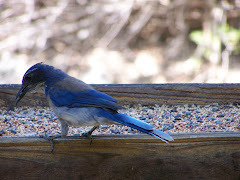 When he is at the feeder, I notice he scratches some of the seed off so it goes to the ground. He seems to be on the aggressive side. When I opened the door to go outside, he was nearby, jumped on a fence but didn't fly away." "2. The other bird is a cute little black and gray one. He's black on top, and seems to be gray on the underside. Flat on the head. He makes a cute little peep and flits from here to there.If you can ID these birds for me I'd appreciate it. I just taken up bird feeding and am curious on what species they are. " Hmmmm. Well, hard to tell without a picture, and I could be wrong, but I would say that bird #1 might be a House Sparrow (not finch), and bird #2 might be a Black Phoebe, but a Black Phoebe is white below. If I saw a picture, I could tell you for sure. If you have one up on Flicker, you can send me the link and I will look at it and tell you. The slightly larger House Sparrows are very aggressive and depending on the season may be dull brown, and the females are very like most sparrows and finches. Drab brown but unlike most sparrows the House Sparrow female is not streaked. The House Sparrow aka English Sparrow is an alien species that nests in cavities in trees and in houses and in street signs that are double. In other words, wherever they can. I often used to see their nesting material hanging out of street signs in the San Fernando Valley. House Sparrows endanger other birds like Western Blue Birds and Swallows who also nest in cavities. They compete for nesting cavities, and they kill others species they think might be competition or just happen to be near by. 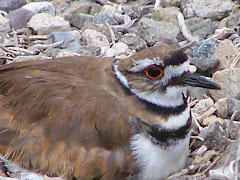 They are often called "The McDonald's Bird" because they are often seen at McDonald's and other fast food or outdoor restaurants begging for food. They can be quite tame and often aren't afraid of humans. FYI if you love native birds, don't feed these aggressive birds. They like a lot of the cheaper seeds like millet. See the section on Feeding in the Silias site below. 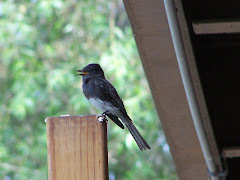 The Black Phoebe is a flycatcher. It flies out and back catching flying bugs. It makes a "cheep" call sound. 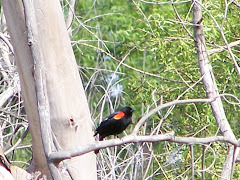 It is a cute little bird and there are more in Orange County than any other county in the United States. They can easily be seen in Huntington Central Park and other parks in the area, but are also found in local yards. Every home seems to have one. To read about House Sparrows, check out these two links All About Birds: House Sparrow and BirdWeb: House Sparrow. This Bluebird site deals extensively with getting rid of House Sparrows: Sialis: Managing House Sparrows. This site has a lot of information about the history of the House Sparrow and its release in the 1800s. To read about feeding birds check out the National Audubon Society: Bird Feeding Basics and Cornell Laboratory of Ornithology: About Birds and Bird Feeding, and our own Sea and Sage Audubon: Tips on How to Feed the Birds. 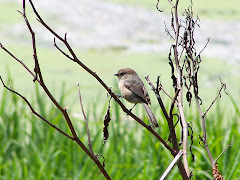 To learn which plants to grow to feed native birds, see Las Palitis Nursery: List of Plants that Naturally Attract California Birds to Your Garden and Sea and Sage Audubon's: Plants that Attract Birds. Good Luck with feeding the birds, and thank you for your question.